Open-air theatre, built 1934. Named in honour of the mayor of Vancouver, William Harold Malkin (1868-1959). Home to "Theatre Under the Stars". Used for performances of musicals. Reverse Text: "Malkin Bowl, Stanley Park, Vancouver, B. C., Canada. Home of 'Theatre Under the Stars'. 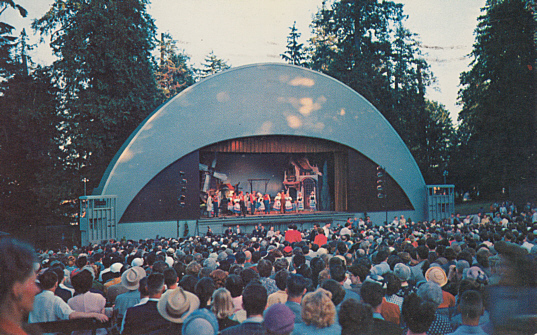 Every evening during the summer famous musical productions, take place in the Malkin Bowl."